So, You Want to Speak at SkeptiCamp NYC? Never Been to SkeptiCamp Before? Mighty bold of you to go swimming with skeptic "sharks", without knowing what you're in for! But, don't be nervous, we really are a friendly bunch! If you have never been to any SkeptiCamp events before, we would recommend reading up as much information as you can from the general SkeptiCamp web site: www.SkeptiCamp.org/wiki/Main_Page. Then, you can visit YouTube, to search for videos of SkeptiCamp sessions in the past! Some Important Points and Rules to Make Up Front! We have a deadline! Although we will try to accommodate last minute insertions as much as possible, we highly recommend that everyone strives to submit their proposal on or before the deadline, to guarantee a spot on the schedule. This also gives you time to adjust your idea if it doesn't quite meet our criteria (although our criteria is generally very relaxed). Current deadline for submitting sessions for this year's event is: 11/25/2018, at 11:59 PM. We will not allow illegal or "abusive" content: Do not hurt anyone, do not incite violence in others, and do not be "spammy". Please do not show us anything that could land you in jail. We very much frown upon bait-and-switch tactics. There may be a legitimate reason why you would wish to change your topic at the last minute, and we will usually allow it, if you talk to us about that! But, deliberately switching out your topic to deceive us of your intentions could get you kicked off the stage! If you intend to swap your topic midway for some comedic purpose, please let the organizers know about that, as well. You can NOT submit more than one session idea. If your first one is rejected, though, we will give you a chance to change it. IF there is time at the end for 'open sessions', we MIGHT consider allowing someone to do a second session, but this is unlikely to happen. The schedule usually ends up getting over-packed before the event even starts! Start your talk with a title slide that says "Zen and the Art of Dentistry", but then spend the rest of your time talking about how awful Right-wing politicians are. That would be a classic bait-and-switch. You should inform us if you are going to talk about politics, instead of trying to hide it. Claim that you will be talking about animal rights, then proceed to instruct us on how to build incendiary devices to use against animal labs. That is not only a bait-and-switch, but is also quite ILLEGAL! You do NOT need any sort of credentials to run a session at SkeptiCamp, since this is supposed to be The People's Conference! But, we warned: You ARE swimming in skeptical "shark infested waters"! If you get the feeling that your topic might be controversial or "wishy-washy" to the minds of hard-nosed scientists, you have to be ready to get yelled at a lot. Of course, those with legit credentials are ALSO welcomed to speak. It certainly would not hurt! Most conventions, that wish to call themselves "legit", do a tremendous amount of careful vetting before someone can take the stage. So, why does this event, which prides itself on skepticism, allow just anyone to have a platform? Because this is intended to ba a "People's Convention"! We do NOT turn away anyone just for their opinions or points of view! We, the attendees of SkeptiCamp, are supposed to embrace challenge when it barrels towards us! ...And because the event is FREE OF CHARGE, and you get what you PAY for!!! That's why! But, please do NOT fake credentials. You are better off professing lack of them, than trying to falsely claim you are certified in something you are not. We do not take kindly to con artists. We can accept session proposals related to science, skepticism, and critical thinking, in some way. Our guidelines are relatively loose, but the closer to those areas you are, the better your chances of speaking will be. We encourage you to present something you are passionate about, or perhaps something you are (or would like to be) an expert on, and definitely something that will interest and facilitate discussion with the others in the group. A good source of presentation ideas can be found here: www.SkeptiCamp.org/wiki/Session_Ideas. Religion: This is NOT an Atheist (with a capital A) event. You are certainly welcome to debunk specific claims made by religious folks, that defy science, especially if they are harmful ideas. (Such as religious exemptions on vaccines) But, please do NOT spend your time bashing anyone's faith, in itself. Those of religious faith, and those who completely lack such things should ALL feel welcomed at SkeptiCamp! Politics: Please avoid political advocacy or blatantly partisan political talks. You can talk about areas where science applies more directly to policy, or you can be skeptical of specific science claims made by politicians. Social Issues: We all believe community outreach is important. But, this is not necessarily just a community outreach platform. We want to talk about topics connected to science in some way. How certain ideas can impact society is fine for discussion. Philosophy: Avoid talks that are pure philosophy, please. (We define "pure philosophy" as: All areas of philosophy NOT concerned with the acquisition of empirical knowledge.) Stick to something that is at least remotely related to science. How we know something is "empirical", in the first place, could be a perfectly acceptable topic, though it is usually a rather boring one. Performances: We DO like to add one or two musical and comedy acts to the schedule, but we prefer not to turn the entire day into a talent show. This event is intended to be an educational conference. Any entertainment provided in the sessions is just a little bonus. You are given a maximum of 25 minutes in which to do your thing, followed by MANDATORY Q&A allotment of at least 5 minutes. Of course, if the body of your session is shorter than 25 minutes, you can spend more on Q&A. A. The Standard Presentation: Kinda old fashioned, and generic, but still popular. You give a presentation, and then the audience gets to ask you questions. This can be done either with or without slides or other visual aids. And, it works well with just about any topic! B. Group-Based Workshop: After receiving instructions, the audience breaks up into groups to carry out the activity. This could also, optionally, be turned into a competition. Keep in mind that you will be responsible for the cost of materials. 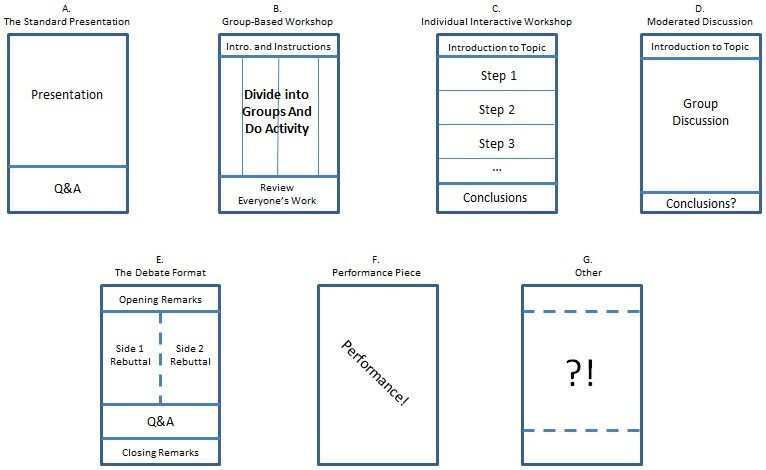 C. Individual Interactive Workshop: Each individual person in the audience gets to carry out all or some of the steps, in the process of an activity. Keep in mind that you will be responsible for the cost of materials. D. Moderated Discussion: You act as the moderator for an open discussion about a particular topic. Essentially, the whole time slot could be like one, long Q&A; but with answers sometimes coming from other participants in the audience, and not just you. This is what SkeptiCamp is supposed to be all about! This might work best for highly controversial topics; or for folks who are not necessarily experts in something, but wish to gain a variety of opinions from others. E. The Debate Format: While SkeptiCamp is not particularly conducive for debates, it could still work; especially if the opponents are both talented in keeping their arguments concise. F. Performance Piece: Can you sing a skeptical song, know a good science story, or wish to educate your fellow humans through comedy? You could fill a block doing just that! If we get a lot of these, though, we might have to limit them, since we would rather focus on discussion and interaction and such. G. Other: If you can think of another great, creative way to fill the time, go ahead and do so! We are open to ideas we might have missed! Keep it Concise! Remember, your time is relatively short. If you think you have a lot to cover, rehearse to keep it short! It might be wise to pretend you only have 15 minutes to talk, to help keep your priorities straight. Then, you can inflate your points where you can during your actual session. Avoid Overconfidence. Especially if you think you have a controversial or potentially pseudo-scientific idea to promote. It does not come off well. You can be confident in what you are saying, but try not to overdo it. Although, those with actual credentials in the field they are discussing can often get away with more apparent confidence than someone who does not. Projector and Screen, with a bunch of standard connection cables. Windows-Based Laptop with Microsoft Office (including PowerPoint), Adobe Reader, and OpenOffice installed. Always the latest retail versions. A dry-erase board with markers, erasers, etc. Wi-Fi will be provided by the venue we rent. However, if your session relies on Internet access, you should have a back-up plan just in case it's not working that day. This may include making local file copies of any videos you want to play from YouTube. You can choose to use your own computer, if you prefer. You will be responsible for responsible for providing anything else you will need. If you need assistance with accommodations, you can e-mail us about that. If you need a Mac computer, you are better off bringing your own, though we have had some folks share their Macs in the past. 3. Register to attend SkeptiCamp NYC, if you have not already done so! We recommend filling in the phone number field, even though it is now optional, just in case we need to contact you. A: When you first register (as in step 3), you will have the opportunity to paste in your write-up after filling out the first couple of pages of fields. And, B: You can also submit your idea on your Profile Editor Page. Sign into the SkeptiCamp NYC site, using the user name and password you created when you first registered. There will be a tab called "Session Info", where you can add, edit (or remove, if you change your mind) your Session Idea. 5. You can continue to edit or tweak your session's description up to The Deadline, 11/25/2018. 6. Within a week or so after The Deadline, the first version of the schedule will be pieced together. You will be notified if you are on it, or not. This will be followed by rounds of tweaks and changes and arguments and counter-arguments and the occasional last minute addition of someone who did not read these instructions. You ARE allowed to continue making changes to your session after the deadline, as long as your session continues to follow the guidelines set above. However, we will NOT likely allow anyone else to enter into the schedule, if all the slots are full. 7. If you have slides, we RECOMMEND sending them to the organizer in advance, so we can make sure they will work properly ahead of time. This is, technically, optional if you want to be super-secretive about it, though. And, you CAN use a different version of your slides than what you provided, if you made any last minute changes. 8.The FINAL schedule will be printed out a minute or two after midnight, the day of SkeptiCamp NYC. You have until then to make your last-minute adjustments. After that, it is committed to paper!! You May Be Recorded! Your Files May be Saved! By default, we record every one of our sessions, for future posting on the Internet. We will probably, also, webcast your presentation live! You CAN opt-out of recordings and live streaming, if you wish. But, unless you say anything, assume it will happen. Also, all of the presentation files I am given are also saved in an archive, and may be available for downloading on our web site, in the future. You CAN opt-out of this, as well. Keep in mind that we DO remove most of the meta-data (hidden properties of the file that might reveal stuff you wouldn't want), before we post them. Your Session Description can, optionally, include a few HTML tags. Rules for that can be found on this page: HTML Rules. Thanks for considering SkeptiCamp NYC, and please have fun!